Resident Deejays MassTransit and Trew spin on the first Wednesday of each month at the Darkroom, featuring guest live hip hop bands, live-PA performances, and artists. Past performers include: Cookies & Dirt, The Opus, Maker, Radius, DJ Spinello, D. Moon, and artists Jason Boulware, CZR PRZ, and Revise CMW. This month's event on September 5th is the fourth in the series and will feature: Basketkase featuring Lomos Marad, and Readymade. The night is on the early hip-hop vibe and the deejays spin lots of classic funk and soul breaks that open up the dance floor. The Darkroom is at 2210 W. Chicago. SLIDE is from 9 p.m. until 2 a.m., $3 before 10 p.m. and $5 after. 21 and over. 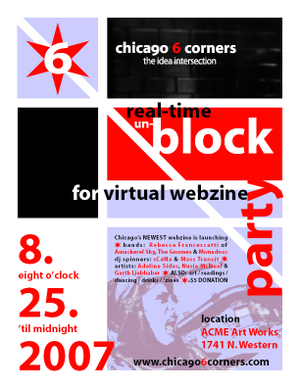 Why: Chicago's NEWEST webzine is launching! Last Word: You enter a random party, you don't know anyone, and the atmosphere is aloof to the point of chilly. You wonder, "What the $%#^ am I doing here?" This won't be one of those Wicker Park parties. One, the music and dancing will be HOT (only the beverages will be cool). Two, the people will be friendly. Three, YOU are the party. Now mingle and stir. Oh, and if you want to contact an editor first and talk 'shop' beforehand click here. See you soon!